That’s a bullet in the barrel of a magical rifle. 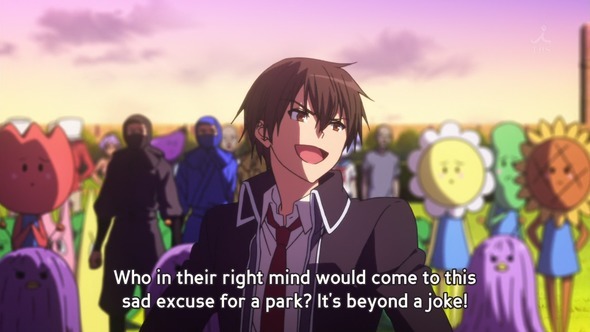 I don’t know how I missed Amagi Brilliant Park #1, and the next thing you know, #2 had come out. 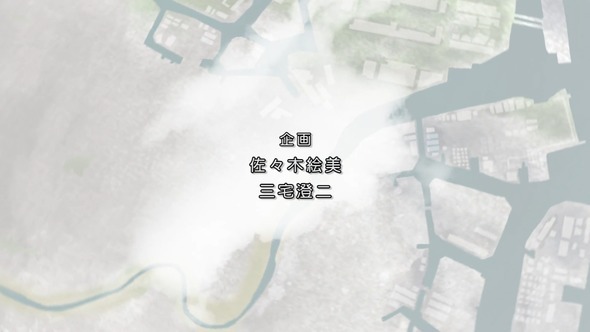 Anyway, as you all know by now, this is about narcissistic high schooler Kanie, who is forced at gunpoint to visit the titular park, the most dismal place in Japan. Then he’s entrusted with the job getting 250,000 visitors in three months, or the fairies who run the place will die, or cease to exist, or something. Episode one treated us to some of the exhibits, all of them terrible or terribly weird. Kanie wants nothing to do with it, but for some reason turns around in episode two. Kanie riles up the theme park’s staff. Production wise, it’s Kyoto Animation, meaning that it looks great and the animation is ahead of most the shows out there now. As for the story, while episode one was done with the the studio’s typical witty style (I loved Isuzu’s deadpan description of each exhibit), something felt lacking. Maybe it was the question why Kanie was chosen for this role of manager. But episode two, more predictable it its story, got me more interested. Maybe it’s Kanie himself. He’s not likable, but will show sudden flashes of insight or deduction that shows he cares more than he’s letting on. His grand, insulting speech to the despondent park staff was partly a ploy to shake them up, but also a chance to let off some steam for the ridiculous situation he’s in, and yet he could have just walked away. Why he didn’t is going to be as big a part of the story as the number-crunching toward 250,000. Fall leaves to set the mood. Our SUPER-POWERED HEROE MEET ANOTHER SUPER-POWERED HERO! It’s not bad, really, but a bit of a letdown considering we’re talking about Trigger. 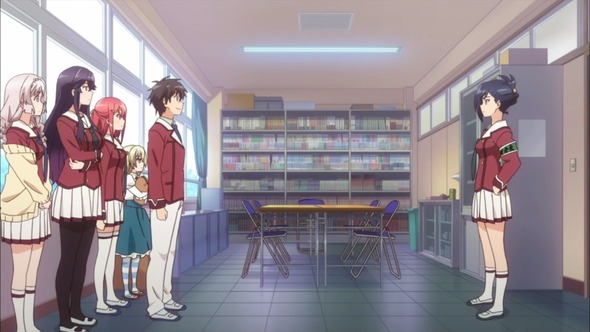 Instead, or maybe it’s all the Chuuni talk in the show, but it felt like the show is trying hard to imitate the recent style of Kyoani, and failing partly because they don’t have the budget. Another problem is that none of the characters are very interesting so far. They’re all types we’ve seen before, plus, Andou, the one male in the group, is annoying, though there was the wise decision by the power-granter (I hope it’s not the smirking bishie we see at the end) to give him an appropriate power, one that looks really cool but that he can’t hurt anyone with. The other girls, more sensible, are given powers that could really screw someone up. More interesting is the mystery of WHY they have the powers, why the stranger, Kudou, got hers but not at the same time, whether we’ll meet others like them, you know, boring backstory stuff. This is Yona, after the fall. Don’t know about Akatsuki no Yona. It’s a straightforward tale about a Princess Yoma, a little spoiled and pampered but not a brat, who meets her beloved Soo-Won around her sixteenth birthday, to the hidden dismay of Hak, one of the lead generals. 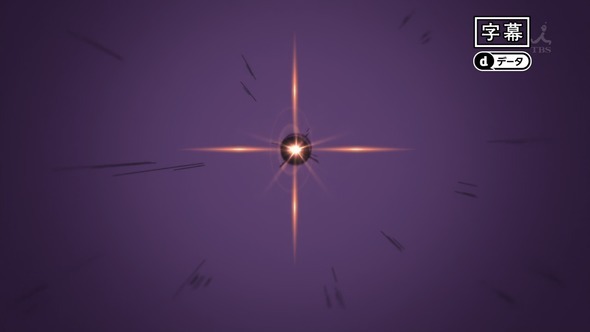 We all know something bad is going to happen because the prologue is a flash-forward to her on the road, and near the end it happens. If I hadn’t read a description already I would have been shocked. Who can sleep with the noise of you killing my father? It want to be big and grand, like that other show, except the animation isn’t as nice. 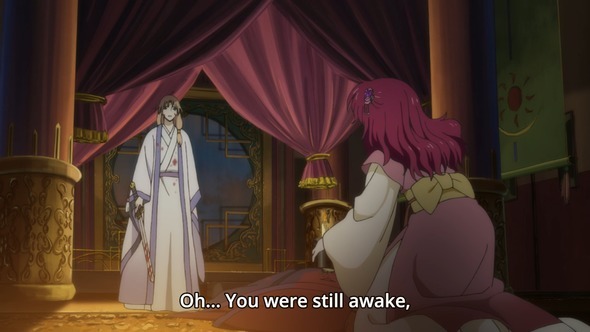 On the other hand, Yona isn’t annoying, and the story looks capable of giving us a few interesting twists. And like that other show this season where a princess is brought down to earth, there is no sexual abuse or cavity searches. I didn’t much care for the little internal monologues they give Yona, endless talk about love and putting people in danger. It’s an odd contrast to her often cartoonish behavior, and often isn’t needed. And I’m not looking forward to the future scenes of the princess being forced to live like the peasants do. Still, good enough to keep an eye on. 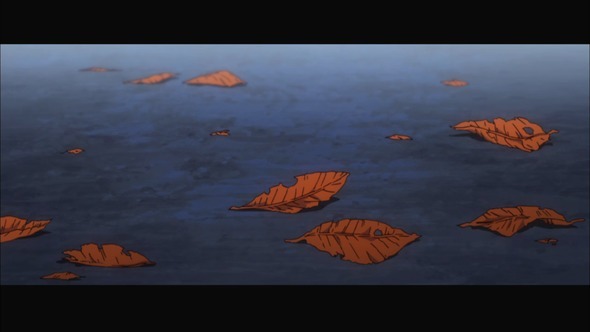 Arata is falling through the depths, you see. Hoo boy, Trinity Seven might be decent or horrible. I don’t think it’s going to be good. 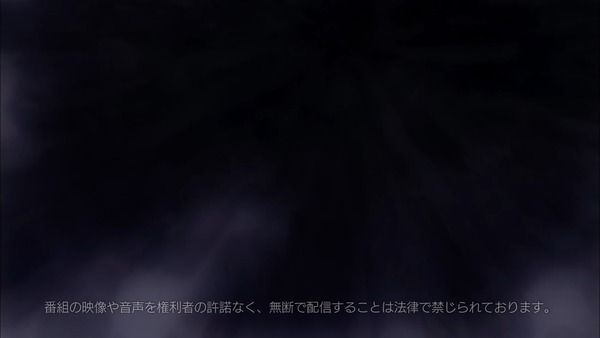 We have Arata, living with his cousin Himiji, who, one day while walking to school, notices that the sun is black. 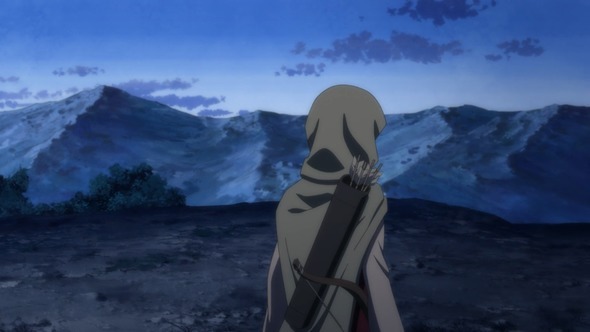 After half a day he decides this is kind of strange and asks Himiji about it, only to discover that she’s not Himiji, the town isn’t what it seems, and he’s not supposed to notice. Then another schoolgirl named Lilith shows up and the two girls give him a briefing about the awful truth while staring daggers at each other. Next thing you know he’s off to magic school, not to save the town or the world or anything, but to get his cousin back and become a harem lead. I suppose that’s as good a motivation as any, considering that Arata is a basic lust-filled adolescent boy who’s upfront about it more than usual. At least he’s not a wuss. 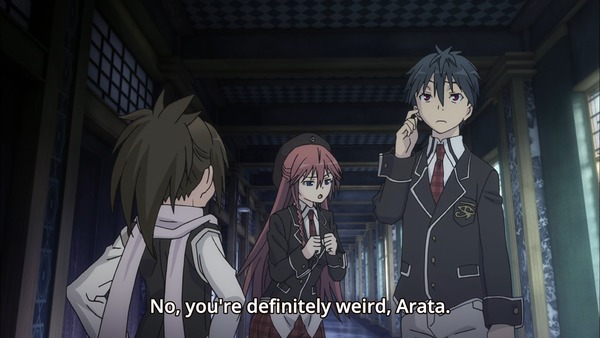 The Trinity Seven of the title are a bunch of gifted magic girls, and his harem, and the show goes from supernatural mystery-laden danger to harem antics pretty quickly. The fact that Arata obviously enjoys his role of harem leader is going to help, because everything else in the show isn’t very interesting right now. On the other hand, we’ve only met two of the girls so far … no, three. I forgot the one in the bath. I have nothing against harems, and I like supernatural light shows, so we’ll see. Hi sCoool! 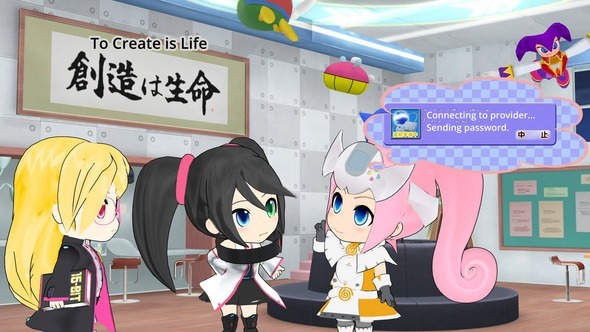 Seha Girl … Do I really want to write about this? … We have three girls, living versions of three Sega game consoles, entering a weird school where they learn about various Sega games by being sucked into them. I’m trying to wrap my head around the concept: game consoles becoming characters in the games people used to play on them. Since the first is a fighting game, I expect we’ll see the girls, er, consoles, get beaten up a lot. That might be interesting for some. It’s done in that gdgd fairies style of animation and is full of Sega in-jokes. Since I don’t game much it’s all going to go whoosh over my head. It’s also sort of ugly to look at. I’ll leave it for the fans of old Sega games, both of you.